Graphic Overlay that forms the user-equipment interface. A membrane switch or keypad is one type of interface utility. Other interface utilities are plastic keyboards, toggle switches, touch screens and rubber keypads. Also known as “flex circuits,” they are popular in part for their low cost and adaptability. They can be used with simple circuitry or advanced. Overlays are the covers which go onto the control panel and show where the buttons are located. They are sealed so that they work great as a front panel interface. We use Polyester materials and polycarbonate. Polyester has a greater life cycle and chemical resistance properties compared to other flex materials. Polyester can go for a million cycles and show little signs of wear. Some of the polyester materials we use for Overlays are: Autotex Velvet; Autoflex EBG gloss; EBA Matte; Autotex XE Velvet for outdoor use; FR-60 Lexan Polycarbonate Gloss which is flame retardant. 3 Adhesive layers connect the layers of the “membrane stack” and also to the machine or equipment it will be mounted on. The circuit layer has silver, screen-printed onto a clear Melinex material which is print treated for adhesion to inks and heat stabilized for stability. 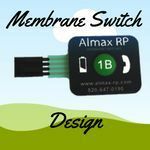 This makes it ideal for flex circuitry for membrane switches and also graphic applications. The Overlay material must withstand flexing that happens when the switch actuates. It must last for the designed life of the switch. Artwork: Most customers will supply a digital file in Adobe Illustrator (.AI) or other vectored graphics program. We have an Artist at Almax-RP who can provide complete artwork services as needed. You can provide any artwork or logos as needed. Almax-RP uses Autocad to create drawings and artwork. Customers should try and provide an Autocad (.DWG) or DXF file to provide the mechanical dimensions. Color Matching: Almax-RP uses the Pantone Color system (PMS) which is the most popular color standard. There’s a Pantone Color guide with over a thousand colors displayed. Almax-RP also uses the X-Rite Pantone Color Measurement application to be as accurate as we can be with color matching. 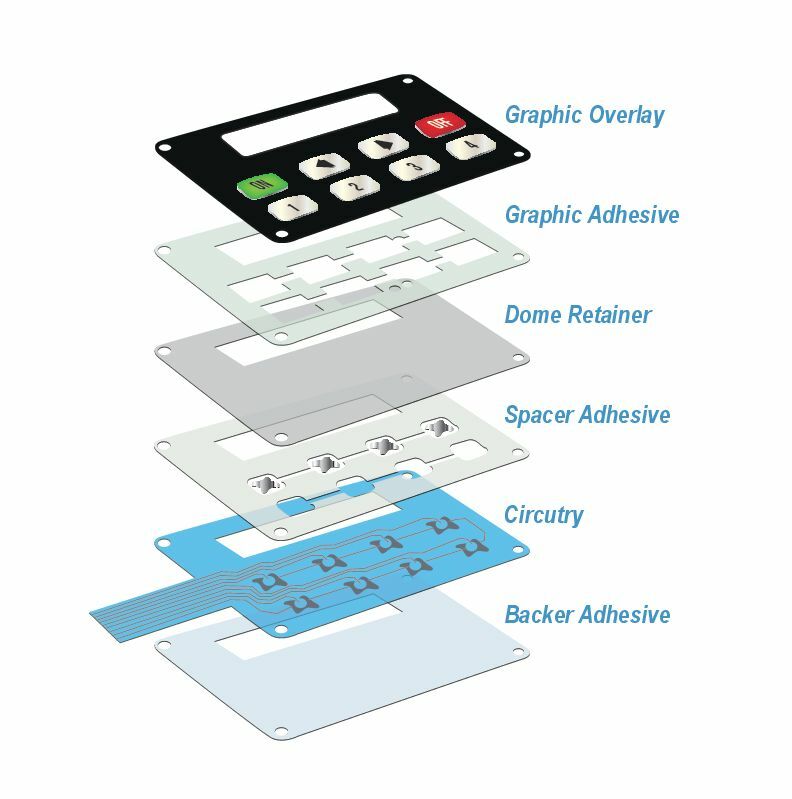 Embossing: Membrane keypads can be tactile or non-tactile. For a tactile feel we emboss the keys to create polyester dome switches. Metal domes are used to create more tactile feedback by giving a snap and completing the electrical circuit. This adds some extra cost depending on the size and type of dome required. We typically use a pillow emboss but can also do rim embossing where only the border of the key is raised. Laser Cutting: For most jobs of 250 pcs or less we like to use laser cutting on the layers of the membrane circuit. The advantages of laser cutting are the ability for tight mechanical tolerances and no other tooling is needed. With larger jobs we can use steel rule dies to make the layers of the keypad as this gives some cost advantages and time savings.